The earliest idea for a double concerto started in 2006 with fellow student and friend Joost Bosdijk, currently bassoonist in the London Symphony Orchestra, after a quite hilarious performance of Jan Křtitel Vaňhal’s classical concerto for two bassoons. We were accompanied by organ instead of orchestra and realised way too late that the organ was tuned to 430Hz instead of the bassoons’ 442Hz, which was patently obvious when we played the theme right after the organ. The result could not be described as ‘greater than the sum of its parts.’ Indeed it was the exact opposite: definitely worse, though definitely more hilarious and memorable. 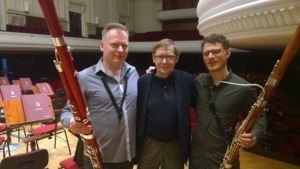 Ten years later, after recording Kalevi Aho’s Bassoon Concerto (for BIS records, with my first BBT commission, Sebastian Fagerlund’s Mana *), I really couldn’t imagine a better showcase for my instrument’s possibilities than that. But I changed my mind, because what is better than showcasing one bassoon…? Exactly! And Kalevi Aho had not only already written a solo concerto for every possible instrument of the orchestra (including contrabassoon); he had also in fact started on various double concertos in the meantime. This, together with my deep-felt motivation to co-operate with great bassoonists around the world, gave birth to the idea for this new commission – the second resulting from my Borletti-Buitoini Trust award. It’s a busy start to my New Year. 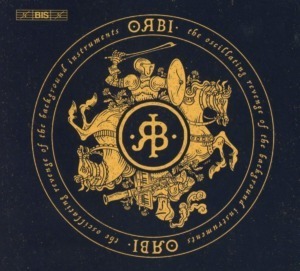 On 1 February my new rock-album The Oscillating Revenge of the Background Instruments (ORBI) is released, my second disc for BIS. The title is a bit of a wink! The repertoire includes arrangements of death-metal, and keeps to the philosophy of bringing my ‘background’ instrument more to the foreground. That’s the focus of my ambition in all of my projects, and this new Aho concerto certainly represents another sweet revenge. I’m convinced that the fact that there are more soloists playing violin and piano, doesn’t mean that bassoonists on average have less capacity to be a soloist. What it does mean to me is that there are probably bassoonists all around the world, working in orchestras, with just such capabilities. For the world première of Aho’s Concerto for Two Bassoons I definitely found one: Leszek Wachnik from the Warsaw Philharmonic Orchestra. Even though I’m convinced these sort of hidden bassoon-soloists are out there, it’s another thing to expect the average orchestra bassoonist to be fit for a new solo piece commissioned from a composer known for his interest in all possibilities of the instrument(s) for which he is writing. Leszek turned out to be one such multi-talented player, able to combine his orchestra job with playing baroque-bassoon, classical bassoon, teaching and being a father of four kids, without a trace of compromise in his playing. On the contrary, he offered more than the inspiration I had hoped for: his effortless mastery over the instrument and his expressivity, together with a really nice personality and a natural aura of trust that everything will turn out fine. This last characteristic I have noticed in many bassoonists, but I’m not necessarily one of them. We had both spent some months practising the piece, and we were very excited to bring everything together with the wealth of orchestral colours that Kalevi had composed. Where Vaňhal often let the bassoonists either literally copy each other or play in cheesy sounding thirds for too long, Kalevi has achieved a piece that really brings out all the possibilities in less than half an hour; I don’t think a single parallel interval has been skipped and the dialogue – that never complies to the standard first/second bassoon hierarchy – is always lively. He has also developed a style in which solo-concerto-versus-symphony borders disappear and make the composition even more captivating and versatile. After this wonderful experience I’m looking forward to the upcoming performances with Steve Harriswangler and the Galicia Symphony Orchestra (November 2019), and Pieter Nuytten and the Antwerp Symphony Orchestra (May 2020). All in all once more a very sweet revenge, and – this time – a far greater sum of its parts! Thank you again BBT, and the Warsaw Philharmonic for making this one-of-kind-concerto possible!